Cathay Pacific today announced changes to its Asia Miles program that will take effect on June 22, 2018. Members will earn more miles for deeply discounted economy class fares, pay much more miles to upgrades, business and first class awards are generally more expensive and economy class/short-haul awards are more competitively priced. You can access Asia Miles website for the change here. (Hong Kong) Asia Miles, Asia’s leading travel and lifestyle rewards programme, is changing the way that members earn and redeem miles when flying. From June, members will earn more miles when they fly Cathay Pacific and Cathay Dragon, and there will be more redemption seats available on those airlines. When members fly Cathay Pacific and Cathay Dragon, they will earn more Asia Miles on 80% of the airlines’ tickets, including those to popular destinations such as Shanghai, Osaka and London. Members will earn miles based on a combination of the cabin class, fare class and distance zone. When members fly other airline partners, the miles earning mechanism will remain unchanged – based on a percentage of actual miles flown, determined by the cabin and fare classes. We are increasing the number of available redemption seats on Cathay Pacific and Cathay Dragon by 20% or more. Members will be able to redeem all Economy Class tickets with fewer or the same miles. Some flight awards on premium cabin classes, especially on longer routes, will require more miles to redeem. All flight awards will be set as one-way so that members can fly to and from a destination in different cabin classes. We are also introducing three enhanced flight award types to choose from – Standard, Choice, and Tailored. Whether members are looking to get the most value for their miles or select the exact travel dates they want, the three award types will make it easier for members to redeem their preferred tickets. We are also launching a new online flight award booking system to provide members with a more seamless experience across desktop and mobile. At a glance, members will be able to check availability of all flights for chosen dates, cabin class, and award type, making it quicker and easier to redeem. “We are making a significant commitment to give our members more of the travel and lifestyle experiences they value,” said Stephen SY Wong, Chief Executive Officer of Asia Miles. The press release states that 80% of the tickets earn more miles under these changes that is probably true because the deeply discounted ones earn more come June 22, 2018. Not sure if infrequent Cathay Pacific fliers will see any benefit from the earning raise though (do they ever earn enough miles to redeem?). The miles earnings are now based on zones and not on the actual distance for Cathay Pacific/Cathay Dragon flights. Partner flights are still credited based on the flown miles. The new award redemption rates are good for those that prefer to book economy class trips using their miles as premium cabin ones are becoming more expensive. Asia Miles now prices awards as one-ways. There is no discount for booking round-trip awards. You can redeem for Cathay Pacific premium cabins using partner miles cheaper compared to Asia Miles (and you can actually reach AA/AS customer service via phone without an issue). Nothing has changed here. 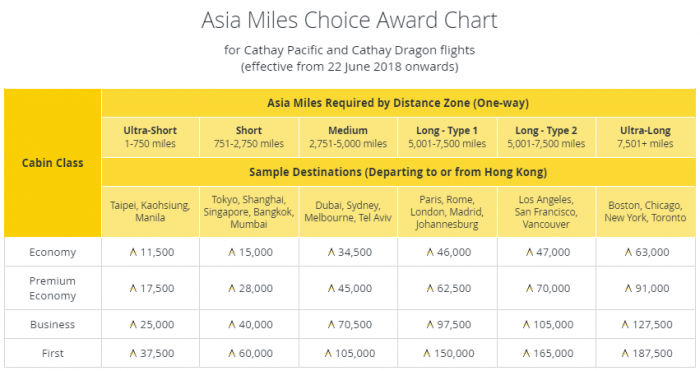 Partner award redemption rates are changing as well but Cathay Pacific Asia Miles won’t release updated charts before June 22, 2018. There are some examples on their website that shows that premium cabin awards are going up in price. Overall, this is an enhancement for those flying on deeply discounted economy class tickets who also redeem for economy. Perhaps 15% to 30% devaluation (quick look) for premium class fliers that also redeem for long-haul business and first class flights.